Yes it is! So, it’s a very slow news week, guys! No patch notes are out yet for any game, so it’s kind of a rough one. This one promises to actually be brief. 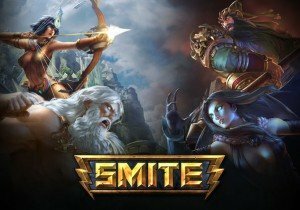 I’m going to talk about Smite Conquest again, now that it’s actually live, and I also want to take this time to thank Hirez Vox. He took the time to come hang out on our stream, talk about casting, the game, toxicity and so much more. So I’m going to embed that here in the post, so you can go watch it too! Learn from the master himself, the voice of Paladins, Vox! Though there’s not a lot of Paladins to talk about, I did watch the Dev Talk stream, and was glad to see there will be a soft reset, some title/skin changes for the upcoming season, and a second ban. Oh my lanta, I am so glad that we’ll have a second ban. It’s needed, now that the roster is bulking up. Will people still waste them? Yeah, it’s online gaming. But we can hope. Always keep hope alive. Okay, Season 5 is officially here! I have to say, I’m pretty excited for this new world we’re in. I’ve played a fair amount of Conquest in the PTS and on the live client, and I’m very happy with it. Now, it’s still a salt factory, and queueing as a five-man is still incredibly rough. Being pitted against another five-man typically means one of you will definitely try to out-try-hard the other, and that’s fine. My solo-queue adventures were pretty fantastic though. Even when we lost, I wasn’t upset about it in the normal matches though. One of the positives, from a Guardian perspective, is while I don’t feel Guardians are as strong as they could be, I had zero problems getting exp, and getting gold. The increase over time really allowed me to catch up when I spent so much time rotating between lanes. Last season, and every season before that, if I spent a lot of time rotating trying to help people, I myself would be worthless in late game. Ganesha five levels under the the rest of the team doesn’t help anyone. So now, everyone on the team has a chance to get exp and gold they need to keep up and stay relevant. It’s a great time to be playing Conquest because now most everyone is on the same footing. Everyone is learning together unless you chose to not play on the PTS. Playing in that last PTS session was the smartest move a player could make. There are optimal routes when running the map to rotate, optimal, new places to ward, there’s so much to learn and test now! That’s wonderful. So, let’s talk about warding a little bit. The first important question is, “who should ward?” which is clear: YOU. If you’re in the game, you should be warding! I don’t care if you’re a mid and you value your stacks more than anything else, you need to ward! Grab one of each at least, two regular wards if you can swing it. Sure, you might be a little behind on items, but what’s better: A part of an item, or knowing the enemy jungler is about to pounce and kill you? The answer is clear. But where should you be warding? Hirez Hinduman actually posted a pretty handy picture for that on Twitter a few days back, that I’ve really been considering. It has aggressive/defensive, and optional jungler catcher ward locations, all handily color coordinated. Don’t. Give. Up. No matter what happens, you win and you lose as a team. Even if things are going great, and you suddenly lose a teamfight. Even if your opponents are just stomping all game. Don’t say this to yourself, “Why am I so terrible? Why did our Thanatos stay at the base? Why is Erlang Shen in the solo lane farming when everyone is fighting over Fire Giant?” Spend less time worry about what you can’t control, and spend more time learning lessons from it. Did you need to communicate better? Did you BM them and now they don’t want to help? Could you have warded, pinged, or rotated? There’s always something you could do, even if you lose and went 0/0/20 or 10/2/19. There’s always something more. Communicate, be positive, and don’t give up. It’s a new season, a new map, a new game. You can do this, guys. I believe in you. If I can get the Ranked skin, anyone can! Is it a perfect game right now? Of course not. There are still things that need to be addressed. To me, one of the greatest things that need to be looked at (and I hate to say this, again, as a Guardian player), but Guardians are very strong. Not in the “being a defensive wall” manner, but more a “damage Cabrakan two-shot our hunter, then two-shot our assassin and there was nothing we could do about it” situation. This could be addressed in a number of ways I imagine, such as decreasing their power scaling, maybe just a little. And I see why it might not have been lowered all around. This allows Guardians to do more than simply tank. Now they can jungle, they can hang out in the solo lane, which is wonderful. But I feel like a few of them are just a little too powerful. Some balance could definitely be maintained, but I don’t know enough about numbers to say exactly what should be done. But they should be looked at before we get too deep into the Season. But Season 5 holds a lot of promise, and I’m very excited for it. A good little article, touched on several things to get people interested. I, as a conquest newbie, appreciate the warding map.